Joy Creek Photo Archive (c) all rights reserved Even after an early frost Physocarpus 'Morning Star' manages to hold on to its golden leaves until December. On our gray, autumn days, they are almost like sunshine. After many years in our garden, this ninebark has achieved an impressive height and width. The three-lobed leaves tend to become chartreuse in part shade but grow more brilliant in full light. The small corymbs of little cupped flowers are plentiful. The flowers often have a pink blush, especially as they age. 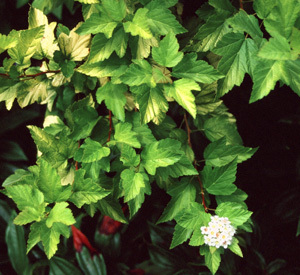 After leaf-drop, its dense branching habit becomes visible. Young golden growth emerging on the stems and branches in early spring is a lovely sight. Late spring. 8 ft. x 8 ft.